In air, sound is usually described as variations of pressure above and below atmospheric pressure. These fluctuations, commonly called sound pressure, develop when a vibrating surface forms areas of high and low pressure, which transmit from the source as sound. 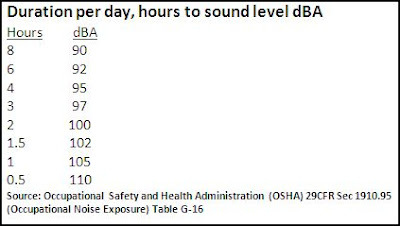 Although noise-induced hearing loss is one of the most common occupational illnesses, it is often ignored because there are no visible side effects, it usually develops over a long period of time, and, except in very rare cases, there is no pain. In its early stages (when hearing loss is above 2,000 Hertz (Hz)) it affects the ability to understand or discriminate speech. As it progresses to the lower frequencies, it begins to affect the ability to hear sounds in general. Most ultrasonic welders have a fundamental operating frequency of 20 kHz. However, a good deal of noise may be present at 10 kHz, the first sub-harmonic frequency of the 20 kHz operating frequency, and is therefore audible to most persons. Ultrasonic welding uses intermittent energy. Only the noise generated during the few seconds of each cycle when the equipment is energized causes exposure to noise. The individual energy cycles are accumulated to equal the duration of exposure. Most of the audible noise associated with ultrasonic sources, such as ultrasonic welders or ultrasonic cleaners, consists of sub-harmonics of the machine’s major ultrasonic frequencies. In extreme cases, this can be disturbing, causing hearing discomfort, occasionally nausea, and sometimes a temporary shift in the threshold of hearing (sound pressure level, or loudness, that can be heard). If there is a line operator or other employees in close proximity to an ultrasonic welding system experiencing discomfort, then hearing protection is recommended. Sound enclosures are also available in most cases that would minimize any discomfort to workers near the welding system. For additional information, please read our White Paper titled “Effects of Ultrasonics on Health”.